Edit 1/3/2019: Just published bug fix patch v2.5.1, let me know if you run into issues! I have just finished work on Network Browser v2.5.0. This update brings quite a few under-the-hood changes, including a migration from the old jCIFS library to the more up to date jcifs-ng library. Since this is a somewhat large change, please let me know if network shares that were working before are suddenly broken, so that I can get the issues addressed. In addition, a new text filter has been added when opening network folders containing a large amount of files. Usage is fairly self explanatory. 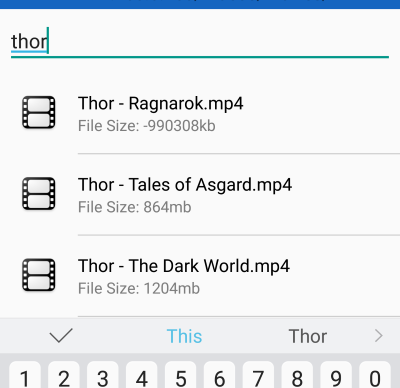 If you navigate to a folder that has more than 20 files inside of it, a new filter input box shows up at the top of the screen, allowing you to quickly narrow down the file list and find what you are looking for. Finally, several bugs have been addressed, including one where license key activation was not working properly. So that's it for today's update. Stay tuned, a lot more exciting stuff to come for Network Browser! As of today... the app, which I have used on my android phone for several years... is dead in the water. My user name and password are accurate, I had my network engineer husband change them, just in case. But it keeps giving me the same error: "Connection Failure -- Network browser was unable to connect using the settings provided. Please check your settings and try again." First I tried deleting (forgetting) the original server nickname, which it did. Then I tried uninstalling and reinstalling which it did but somehow it retrieved the original server name? From where I do not know... in any case, I REALLY like the simplicity of this network browser and I'm seriously bummed out... HELP? @Traceyinpa I think others have had issues related to the new SMB library change in the last release. I might have to do an update to switch back to the old configuration until I can figure out what is going on. What happened ? Network browser stopped working...just tests connection but won't connect.